Warm Greetings! Awsome updates and new content types love the additions... I like this content type alot and I'm trying to use it in grade 4 it has great potential if we could use multiple images not just 2... in essence it will be like a timeline of images or so.. order could be like before 》after 》after that》 finally... this will make writing easier sequence of events, 3d objects like cells cross sections.. or anything that uses layering. ..
Lastly, is there a plan to make something like video conferencing but instead of video a teacher could send content/activities to the students ... this is really big but would be great to have it as classroom content type where students log in to a class and then the teacher asigns them activities/h5p content students must complete them... . Does this make sense or am I talking nonsense. ..
Glad that you like Image Juxtaposition. Small improvements have already been implemented, but not released yet. Can you spot them? I think what you're describing might be a nice feature, but I wonder whether Image Juxtaposition should be adapted to accept more than two images, or whether a new content type should be created. It could feature a slider below the image area, and it could be used to gradually blend from one image to the next. Does this make sense and grasp what you have in mind? Wow that's interesting.... yes I agree with you ... checked out the enhancements very nice indeed can't wait to give it a try. 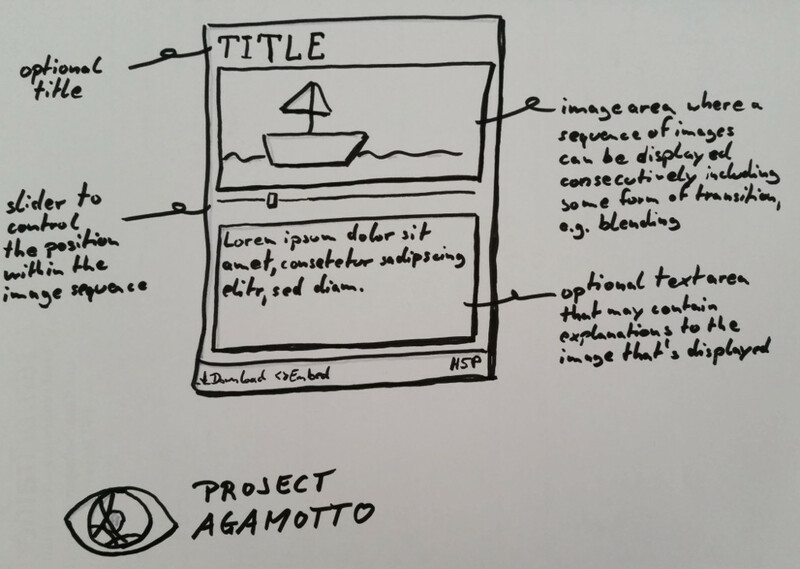 ..
What if "Agamotto" also had an optional text area, and its contents changed as well when sliding? Just an idea ... What do y'all think? I was thinking about something like in the sketch that I attached. OOhhh wee.. that would be so beneficial in k-12 schools. .. my I am sure I can use this in every single lesson... this will be a great addition..
well done!!!... can't wait for the release.... I saulte you... one detail that might enhance the end user focus is! the transitioning will it be possible to make the transition slider.... snap into position with ease.. I can't quite explain this but to easily but not quickly find the next image.. does that make sense? Makes total sense, and it is possible. Thanks for your suggestion! Looking super... waiting for release. .. There are some more things to do (especially cleaning the code a little bit), but I think I will find enough spare time to polish everything this week. I would like to thank you for all your contribution and hard work in behalf of the h5p community. .. Sorry that it took some time. Sorry that it took some time. You can now find Agamotto among the other H5P examples and soon in the H5P Hub, too. Hi I was just wondering if we could make it touch enabled.... just a thought in other words the picture or text could have this slide to the right or left.. not only the slide button easier on touch devices.. Thanks for the suggestion. Have you already updated to the latest version via the H5P hub? If yes, there might be a bug because I added that feature already and it seemed to work on Android devices and iOS devices alike. Just let me know, please. Wow that's awesome. ... should have known that you will do your due diligence it is awesome. .. would you be interested in looking into wordsearch and crossword content types please. .. if you have time that is.. if I'm to tell you how valuable both content types are in k-12 schools and building vocabulary in students and motivating them they are really awesome. ... and needed.. If you're doing some greenfield development, you chould check out the technology-stack we're using for the (soon to be released) Audio Recorder. Here is some boilerplate code to get started from (I should update it with the latest stuff we've done too). Thanks Tom! I'll have a look. Hope you are doing great! just a gentle reminder if you had a chance to look at wordsearch/crossword content types.. this will be a great addition to learning new vocabulory to students in k-12 schools.. Thanks for reminding me :-) Right now, I am on vacation and using the time for learning some programming for Android and preparing to move to a new place, so unfortunately I am not very productive for H5P :-/ I have some plans to possibly get some more time for coding in addition to my regular job, but even this will have to wait until July after I have moved. Great news! I hope it won't be a bother to keep reminding you. ..
Just a brief status update from my side :-) I have successfully moved to a new place, not completely unfortunately. My communication provider failed to deliver on time (again btw) and I'm stuck without a network connection at home. I will be decently connected with the world again as of monday - at least I hope so - and that's probably when I'll be back at coding for H5P. Getting Internet up is always 1st priority whenever I've moved. Have a great summer Oliver! :) And good luck in setteling into your new place!